Features: Deluxe set includes: four of the most popular tip sizes in straight, 45deg and 90deg angle configurations. Versatile, heavy-duty pliers are designed for the removal and installation of either internal or external snap rings on a wide range of applications. Pliers have a cushion plastisol dipped handle and are designed for heavy duty use. Features: Deluxe set includes: four of the most popular tip sizes in straight, 45deg and 90deg angle configurations. Versatile, heavy-duty pliers are designed for the removal and installation of either internal or external snap rings on a wide range of applications. 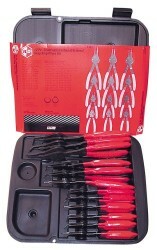 Pliers have a cushion plastisol dipped handle and are designed for heavy duty use. Set is packaged in a rugged plastic case which makes storage secure and convenient.